My love affair with lettuce wraps began when I spent some time in South Korea in college. While there, we would go to restaurants where the meat was cooked right at the table and was served with many wonderful Korean side dishes, rice, and leaves of greens. It took me a bit to figure out the process, but through observation, I realized what to do - get the piece of lettuce, add some meat, some rice, some toppings and maybe some sauce, fold it all up and pop it in your mouth. Amazing. Ever since, I have loved lettuce wraps of all kinds. This recipe is a very simple one, with the veggies and meat and sauce all cooked together so that there is only one final step at the table - fill the lettuce leaf - and then enjoy!! Finely dice veggies (or use a chopper), keeping mushrooms separate. In a small amount of olive oil, saute carrot, red pepper, green onion until beginning to soften. Add mushrooms and saute a few minutes more. Add 1/4 cup soy sauce to the veggies, allow to simmer for 5 minutes. Transfer veggies to a bowl. In same skillet, brown ground turkey. Once browned, add cooked veggies and 2 Tbsp Hoisen Sauce; mix. Add 1 cup cooked quinoa; mix well. Serve wrapped in Romain leaves. I am never very confident cooking fish. Often on Fridays, we will visit local fish fries I say we are trying to build community and support the church by going...those reasons are true, but I am scared of cooking fish. Recently, there were some great sales on fish at my local Shop N Save. I stocked up without a real plan for cooking it. It's been too cold to drag the kids to the fish dinners so I tried this recipe I found on Pinterest. John, who only really likes fish if its been fried, went back for a second helping. I thought the fish was delicious and easy. I wish I'd seen this recipe earlier; I would have saved a lot of money. I love simple meals that make one dish dirty. Just got another bag of fish from the deep freeze because I will be making this again tomorrow. Preheat oven to 375 degrees Fahrenheit. Lightly grease 9 x 13 baking dish with oil. Place fish fillets in baking dish. Season with salt and pepper. Arrange mixed vegetables around the fish; lightly season with salt and pepper. Cover with aluminum foil and bake 30-35 minutes until fish flakes easily with a fork and vegetables are tender. year, Costco carries heart-shaped ravioli. All have been great hits. I decided to try a new Valentine's recipe this year. Snack mixes offer so many fun options, and honestly can be as healthy (or not) that you want to make them. This one uses freeze-dried strawberries as the source of the beautiful red color. 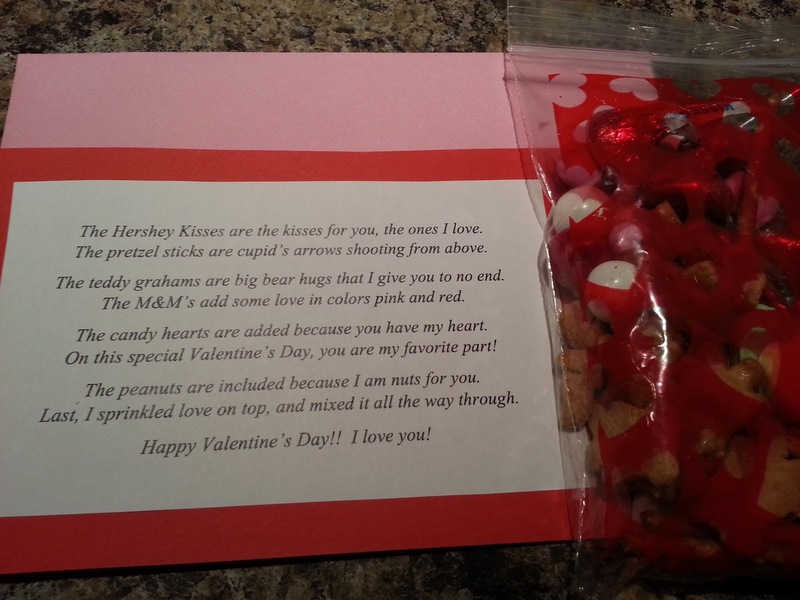 You can add just about anything - chocolate chips (white would be nice looking with this), pretzels, candy hearts, peanuts, pink and red m&m's, and the list goes on. I decided to keep it simple and healthy and just added dried cranberries to the mix. In a food processor (or in small batches in a chopper) combine strawberries, powdered sugar, and salt. Process until most of the strawberries have been crushed into a powder. Pop your popcorn. Option 1: Use an air popper. Option 2: Add oil and kernels to a large pot (6 quarts or more) and cover with tight fitting lid (or use a stove top popcorn maker and follow instructions). Turn heat to medium and begin to slide and shake the pot back and forth over the burner until the kernels will begin to pop (after about 2 minutes). Keep sliding/shaking pot until popping begins to slow down then remove from heat. Wait until popcorn has stopped popping before removing lid. Transfer popcorn to a large bowl. If you used an air popper (like I did), you will need to add the melted butter to the popcorn and mix well so that the powder can stick to it. If you used the stove top method, the oil should help and you may not need the butter. While stirring and mixing well, shake the strawberry mixture onto the popcorn. Add any remaining ingredients of your choosing. Why Skip Dessert? - Special Guest Post! 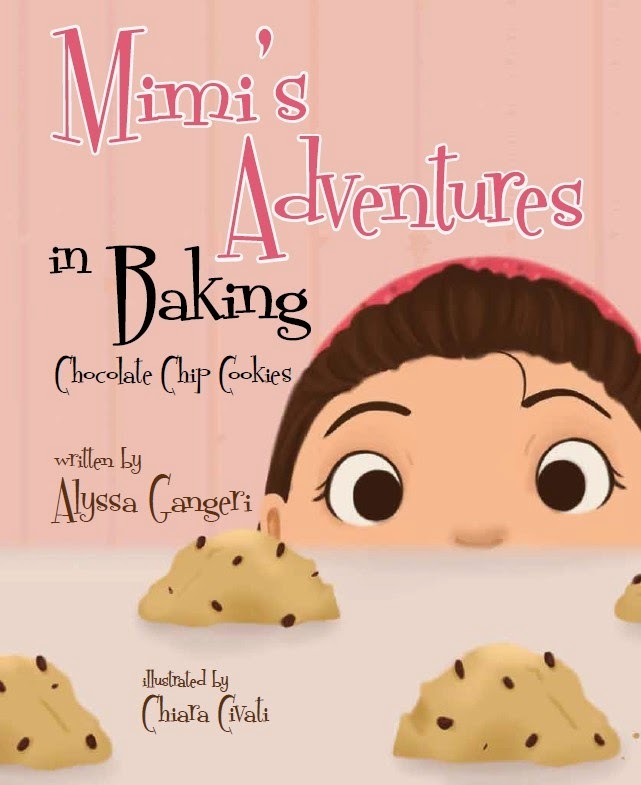 We are thrilled to present a guest post by Alyssa Gangeri, an NYC chef and author of the brand new children's book Mimi's Adventures in Baking Chocolate Chip Cookies. As a child, Chef Alyssa loved baking and everything that came with it. As an adult and food lover she realized there was something missing when she frequented bookstores: an interactive children's cookbook. And we are not talking about a boring old cookbook for kids with lots and lots of recipes and some pictures. Children these days have just as much interest in the kitchen as their parents do, but the ordinary cookbook is just not going to cut it. She created Mimi's Adventures in Baking to give children and adults a way to get into the kitchen and allow the child to become the chef and the adult the assistant. Each book has one recipe and an interactive story line the child can read, and at the end go into the kitchen and do what Mimi did! And for the "non-baking" parent, these elite pastry chef recipes are tested and ready for even the most inexperienced baker! That is the question? Why would you ever skip dessert? As a pastry chef and now children’s book author, I encounter a lot of people that spend countless hours preparing a wonderful dinner and skip dessert! The horror! Maybe it’s the pastry chef in me, or the inner child in me but come on who doesn't love dessert? One thing I have learned is that desserts and pastries are very intimidating to prepare and most cooks are completely frightened by the baking process. It’s a science; everything thing needs to be exact down to the correct measurements, to the perfect bake time. Which, understandably, is very intimidating. While on my road to being published I started working with my recipes to make them kid-friendly and most importantly mom-friendly. Baking is something you can enjoy doing together. It’s an experience that can last a lifetime and shape your children into who they become. Learning discipline, counting, measuring, following directions and safety are very important. We all need dessert to survive… I mean, food to survive. Okay, so let me get to my point. If I said you can make one of the best classic desserts but in a whole new way and it is fool-proof, would you believe me? If I told you that you could make a dessert that will make your whole family happy in less than 30 minutes, would you believe me? Well, believe it because it’s true! I love recreating classic children’s desserts in a whole new form that even your dinner party guests will "oooh" and "ahhh" over. I think classic children's desserts are nostalgic and immediately bring back memories. Desserts are supposed to be fun and make people happy… hence, why would you ever skip dessert? It’s worth the calories and we all know it. Don’t deny it. No judgment here! I am going to show you a nostalgic dessert that will wow guests or your family. Meet the No Bake S’mores Pot de Crème… oh that’s right you heard me! I like to do them in little coffee mugs; I think it gives them a cute look and any dessert in a cup people love. Who wouldn't love to pick up their cup and go to town on a chocolate s’mores pot de crème? And let’s be honest -just the name sounds impressive! This is a no bake product so what you are going to do is: start off by bringing your half and half to a boil. Once boiled, combine your eggs and sugar together and whisk until fully incorporated and eggs are scrambled. Place the bowl with your egg mixture on a dish towel to ensure while whisking it won’t move around on you. Slowly pour your hot half and half over your eggs while whisking at the same time to ensure you do not scramble your egg. Once you have add all of your half and half to the egg mixture and it is fully incorporated, you can then add in your chocolate. Whisk until fully melted and incorporated. If you still have some little chunks, feel free to place your bowl in the microwave to warm your mixture. Stir every 30 seconds. Place your filled cups in the refrigerator for about 20 minutes or until set. You can always pop them in the freezer if you’re in a rush as well. They just need to cool completely to set. Next and final step… Top with those lovely marshmallows. For you dessert lovers that have a mini blow torch break it out and fire away! For all of you regular people that don’t but everything you see in Williams Sonoma feel free to use your broiler for this step. I like to put my broiler on high, and place your cups on a sheet pan and stay close! Watch as your marshmallow caramelizes. Pull them once they have reached the desired toasted color. (This will not take long so DO NOT leave the oven. Keep the door open and watch them.) Once finished, place a piece of graham cracker in and serve! It’s that easy! So now you have no reason to skip dessert and everyone is going to be talking about your S’more Pot de Crème for days! Be prepared to have to make them again… just forewarning you!